Office Hours for Spring 2019: Thursdays 9–9:50 am and by appointment. Dr. Serhy Yekelchyk received his BA from Kyiv University and an MA from the Ukrainian Academy of Sciences. 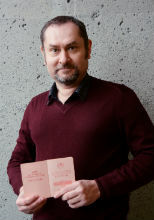 Following a research fellowship in Australia in 1993–94, he came to Canada in 1995 to pursue a Ph.D. in Russian and Eastern European History at the University of Alberta. His dissertation analyzed representations of the past in Stalinist culture, with special emphasis on Soviet Ukraine. After graduating, he taught for a year at the University of Michigan (Ann Arbor) before coming to Victoria in 2001. Dr. Yekelchyk’s research interests evolved since then to include the social and political history of the Stalin period, as well as the formation of a modern Ukrainian nation from the mid-nineteenth century to the present. His Ukraine: Birth of a Modern Nation (Oxford University Press, 2007) was the first Western history of Ukraine to include the coverage of the Orange Revolution and was translated into five languages. His monograph on late-Stalinist political rituals appeared in 2014 and a book about the current Russian-Ukrainian conflict is coming out in 2015. Dr. Yekelchyk is cross-appointed between the departments of Germanic and Slavic Studies and History and teaches a variety of courses on Russian history, Stalinism, Modern Ukraine, and Cold-War cinema. He supervises graduate and Honours students working on various aspects of Russian and Eastern European history and culture. The Conflict in Ukraine (New York: Oxford University Press, 2015). Stalin’s Citizens: Everyday Politics in the Wake of Total War (New York: Oxford University Press, 2014). (guest editor) Moving Images: New Perspectives on Ukrainian Cinema (Canadian Slavonic Papers 56, nos. 1–2 [March–June 2014]). (guest co-editor with Andrew C. Gow and Roman Senkus) Confronting the Past: Ukraine and Its History (Journal of Ukrainian Studies, Vol. 35 [2010-11; published in 2012]). (guest editor) Ukrainian Culture after Communism (Canadian American Slavic Studies, Vol. 44, nos. 1-2 [Spring-Summer 2010]). Ukrainofily: Svit ukrainskykh patriotiv druhoi polovyny XIX stolittia [Ukrainophiles: The World of Ukrainian Patriots in the Second Half of the 19th Century] (Kyiv: KIS, 2010). [in Ukrainian]. (co-editor with Oliver Schmidtke) Europe’s Last Frontier? Belarus, Moldova, and Ukraine between Russia and the European Union (New York: Palgrave, 2008). Ukraine: Birth of a Modern Nation (New York: Oxford University Press, 2007). Choice magazine Outstanding Academic Title (2007). Polish, Lithuanian, Russian, Ukrainian, and Hungarian translations. Stalin’s Empire of Memory: Russian-Ukrainian Relations in the Soviet Historical Imagination (Toronto: University of Toronto Press, 2004). Ukrainian translation: Kyiv: Krytyka, 2007. (co-editor with Marko Pavlyshyn) Ukrainians in Australia. Vol. 2: 1966-1995 (Melbourne: Australian Federation of Ukrainian Organizations, 1998) [in Ukrainian]. The Awakening of a Nation: Toward a Theory of the Ukrainian National Movement in the Second Half of the Nineteenth Century (Melbourne: Monash University, Slavic section, 1994) [in Ukrainian]. “Ukraine and Russia in Crisis.” Agnes Scott College, Atlanta, GA, 5 March 2015. “Nationalist Heroes on the Silver Screen in Independent Ukraine.” 46th annual convention of the Association for Slavic, East European, and Eurasian Studies, San Antonio, TX, 19–22 November 2014. “The Ideological Park: How the Tsar’s Garden in Kyiv Became a Modern Political Space.” International Workshop on “(Post)Socialist Spaces,” Universität Tübingen, Germany, 6–8 November 2014. “The Anti-Maidan Landscape: Kyiv and the Regions.” International Workshop on “Ukraine 2014: Maidan, War, Geopolitics,” Tenth Annual Danyliw Research Seminar on Contemporary Ukraine, University of Ottawa, 30 October–1 November 2014. Roundtable participant, “The Never-ending War to End All Wars,” Conference on “The First World War: 1914–2014: Transnational, Local, and Interdisciplinary Perspectives One Hundred Years Later.” University of Victoria, 2–3 October 2014. “How a Plaza Became the Maidan: A Spatial History of Celebration and Protest in Modern Kyiv.” Seminar series of the Canadian Institute of Ukrainian Studies, University of Alberta, 10 September 2014. “A Multinational History of Ukraine’s Revolutionary Age, 1917–1930.” Summer School on Jewish History and Ukraine’s Multicultural Past, Center for Urban History, Lviv, Ukraine, 29–30 July 2014.